Publisher: Sterling Publishing Company, 1999. Soft Cover, 256 pages, 6 x 9. The Beverage Testing Institute's Buying Guide To Beer is a no-nonsense guide to the best beers from big and small brewers throughout the world. Compare domestic and imported varieties of stouts, porters, lagers, and more. The breweries and brands are arranged alphabetically in chapters according to geographic loctation: U.S. and Canada, United Kingdom and Ireland, Germany and Austria, the Low Countries and France, and the rest of the world. 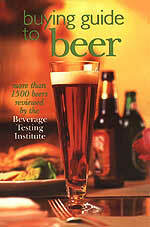 Plus: notes on such characteristics as appearance, aroma, and taste for every beer rated, and information on beer styles. The Beverage Testing Institute of Chicago, Illinois, which rates spirits, wines and beers, is the world's largest and oldest independent beverage testing service. It does not accept advertising from companies that submit their products for review. The final results of the panel judgings are presented through a simple 100-point scoring system that ranges from 96 to 100 for superlative to 80 and below for not recommended.